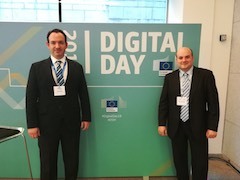 On 10 April, MERLIN project attended the Digital Day 2018 conference, organised by the European Commission under the Bulgarian Presidency, and the Commissioner for Digital Economy and Society, Mariya Gabriel. 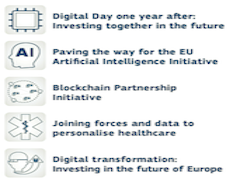 This day brought together politicians from more than 20 member states to discuss the digital future of the European Union, and collaboration agreements were signed for the creation of European platforms to develop technologies related to Artificial Intelligence, autonomous driving, eHealth, high-performance computing and Blockchain. The Innovation Radar innovation search tool was also officially launched in the closure of the event.